The Origin of Karate Joe was the first comic I wrote and illustrated in the 'Karate Joe' series. It is the simplest, shortest and least complicated/detailed of the three. 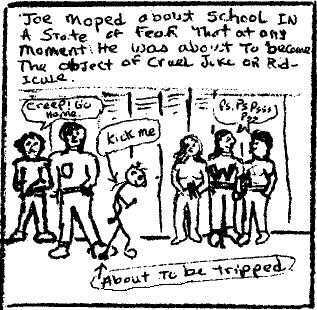 Joe moped about school in a state of fear; that at any moment he was about to become the subject of some crule joke or ridicule. The first issue. Karate Joe Comics No.1: The origin of Karate Joe. The second issue. Karate Joe Comics No.2: Karate Joe's revenge. The final issue. Karate Joe Comics No.3: Karate Joe the Crime Fighter. Back to the Front Door of Rob's World!. Karate Joe Comics were written and Illustrated by: Robert L. Vaessen back in the early 80's. Copyrights are held by the author, and these 'Comics' may not be distributed for profit or other compensation of any type, without the express written permission of the author. If you have comments or questions about the 'Karate Joe Comics' please feel free to e-Mail me.